Take a look at some of our Special car rental uganda offers with incredibly discounted car rental rates. All of our Self drive car rental uganda offers come with a comprehensive insurance cover, Bradt Guide book, Uganda Road map, a mobile phone with local SIM card, Unlimited mileage, 24-hour roadside assistance, Free Airport pick and drop. Rent two of our Rav4’s for a self drive car rental in Uganda with either family or friends and get upto US $80 Discount per Car on one of our well put-together Pre-arranged Trips under Car rental & Accommodation. 21 Days Uganda in style. 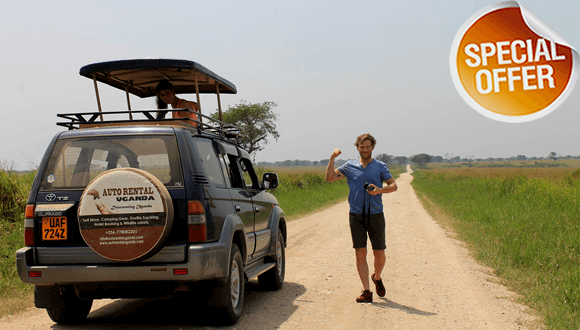 Discover The beauty of Uganda renting a car and driving to an inspirational Safari in Uganda. This Group self drive car rental in Uganda special offer is available throughout the year of 2018. Start planning your journey today with us. 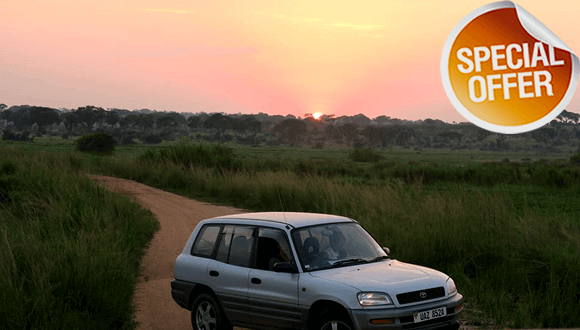 Hire a car in Uganda for 25 + days and get FREE Quality camping gear. Save as a couple upto US $ 200 and enjoy an inspirational self drive camping safari. This Self drive camping safari Special offer is available in the months of April + may 2018 and October + November 2018. Book as a couple and get Favourable discounted offers for self drive. Save upto $100 as a couple hiring a Toyota Prado landcruiser on our Well put itinerary 15 days Classic Uganda safari. Whether you opt for the lazy camping or Mid range accomodations, Recieve a US $ 100 off and save as a couple traveling in our comfortable pop-up roof safari land-cruiser. You can also save a 5% when you hire the same landcruiser with our quality camping gear. This Special offer is available in the months of Apirl, May and November 2018. 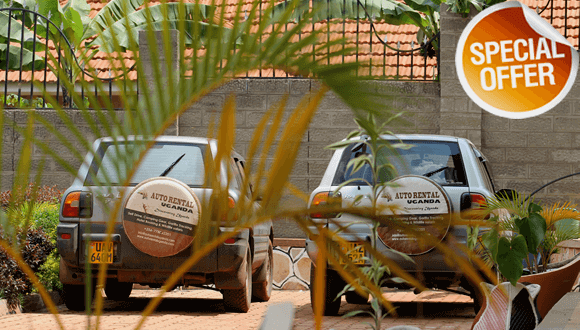 Inquire with us and save big on your next Uganda car Rental deals.